First and foremost- welcome to Planks and Planes. At this point I should say hi to my only two readers at this point- my husband and best friend! I am really looking forward to documenting all of my workouts, trips and races on the blog for everyone to enjoy. Here is Monday night’s bootcamp workout. Complete 25 reps of each exercise. 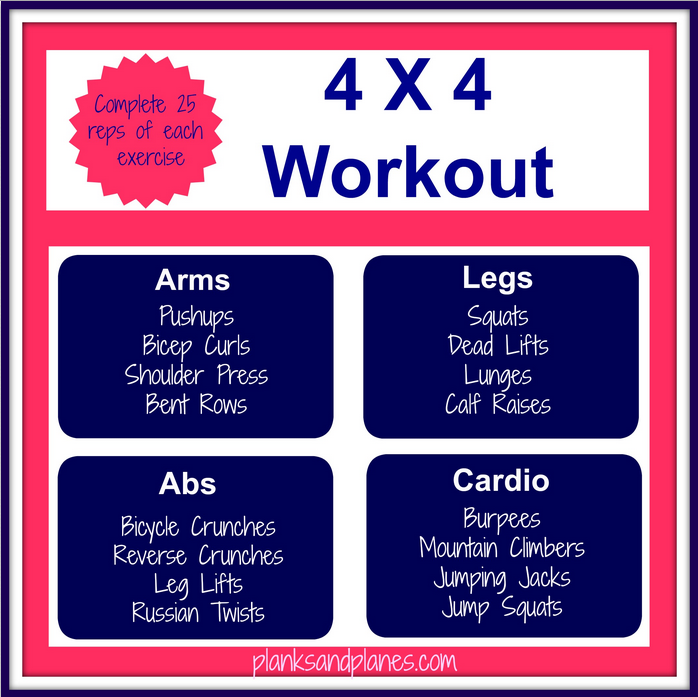 Completing the workout will give you an all over body workout! A banana with peanut butter and a skinny latte. I try to drink at least 96 oz/day. When I work out I drink at least 128 oz/day. What is your current favorite workout? Running! Just cannot beat the way I feel after a good run whether 3 or 13 miles! I have no idea as I do not count calories. Banana and peanut butter, an apple and string cheese, popcorn, veggies and hummus, hard boiled eggs. Since I go out pretty regularly for lunch with my company I usually eat salads or fish. When I am doing lunch solo, I tend to eat whole wheat chicken or turkey sandwiches. What is your favorite body part to strength train? What is your least favorite body part to strength train? What are your “bad” food cravings? My favorite way to indulge a little (especially after a long run) will always be ice cream. It varies in regards to my lunch meeting schedule. Sometimes I can eat out 5x in one week while other times I can go almost two weeks without eating out. I rarely eat at fast food chains unless it is to get a diet coke. If you count Chipotle and Subway though then yes quite often because those are two of my favorites. Yes but since I teach at the gym, my membership is free which is a great perk. I aim to get at least 7 but since I often wake up very tired, I can’t wait to see how many hours I am actually seeing when I start using the fitbit. Do you have a “cheat” day? Nope. After any race I do allow myself to anything my heart desires. Otherwise I try to make healthy decisions as much as possible. Plus I feel much better about eating a cupcake if I ate healthy the rest of the day.. it’s all about moderation. Yes. I rarely drink hard liquor but I definitely enjoy a glass or two of wine on the weekends! My husband and I work out 90% of the time together. Definitely my mindset. My confidence has grown significantly; I have become much more aware and appreciative of my body. I am much more willing to push myself to do and try new things whereas my fear used to hold me back. What was the last healthy thing you did? Leave a comment answering any of the questions from the survey. This entry was posted in Fitness, Survey, Workouts and tagged Fitness, Survey, Workouts. Bookmark the permalink.